Decorative caps and bases for round half columns. Column Base Height: 4-3/4 in. Column Base Inside Diameter: 6-3/4 in. Column Base Outside Diameter: 12-5/8 in. Column Base Projection: 6-1/4 in. 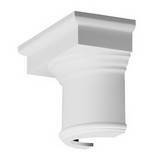 Column Capital Height: 4-7/8 in. Column Capital Inside Diameter: 5-3/4 in. 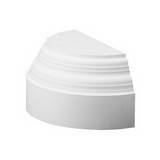 Column Capital Width: 13-3/4 in. Column Capital Projection: 6-3/4 in. Column Base Height: 22-1/2 in. Column Base Inside Diameter: 9-1/4 in. 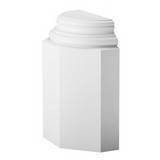 Column Base Width: 13-3/4 in. Column Base Projection: 6-7/8 in. Column Capital Height: 11-5/8 in. Column Capital Width: 14 in. Column Capital Projection: 7-1/4 in. Column Capital Height: 11-3/4 in. Column Capital Inside Diameter: 7-1/2 in. 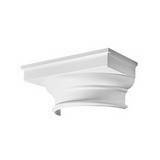 Column Capital Width: 14-3/8 in. Column Capital Inside Diameter: 9-1/4 in. 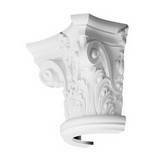 Column Capital Width: 16-3/8 in. Column Capital Projection: 8-1/4 in. Column Base Height: 7-7/8 in. Column Base Inside Diameter: 12-1/4 in. Column Base Outside Diameter: 16-7/8 in. Column Base Projection: 8-1/2 in. Column Capital Height: 6-1/4 in. Column Capital Inside Diameter: 7-1/4 in. 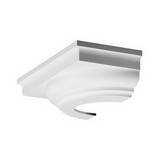 Column Capital Width: 17-3/4 in. Column Capital Projection: 8-7/8 in. Column Base Height: 22-5/8 in. 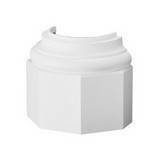 Column Base Width: 17-7/8 in. Column Base Projection: 8-7/8 in. 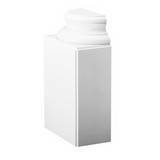 Column Base Height: 16 in. Column Base Inside Diameter: 11-3/8 in. Column Base Width: 18-1/4 in. Column Base Projection: 9-1/4 in. Column Capital Height: 8-1/2 in. 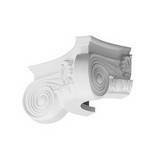 Column Capital Inside Diameter: 12-5/8 in. Column Capital Width: 19-1/8 in. Column Capital Projection: 9-1/2 in.